Fits adult size. 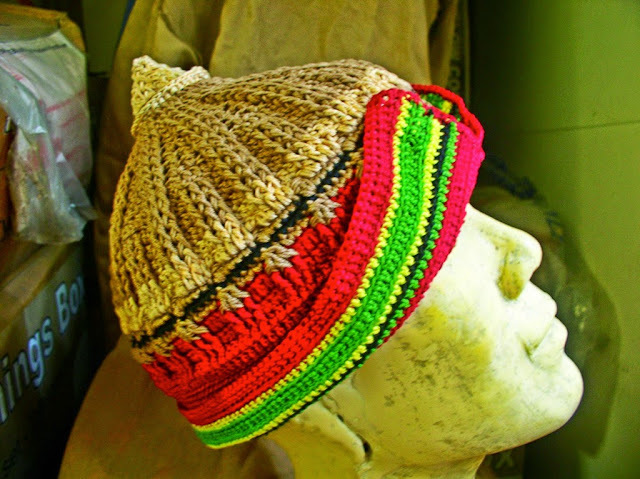 Hat shown is approximately 22 inches in circumference and 10.5 inches tall. 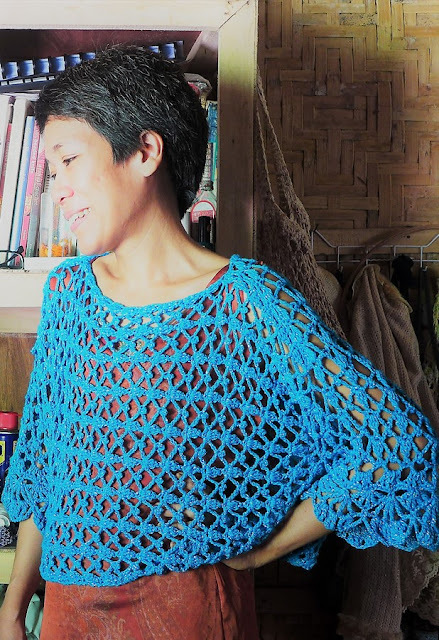 • Choose Sport to DK Weight yarns for this pattern and choose a strong stiff fiber such as cotton or linen or blends. 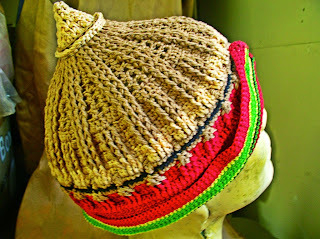 Soft yarn will make the hat floppy. The hat is made in multiples of 12 + 1. If you would like to make the hat in other sizes, commence with a chain in multiples of 12 + 1. 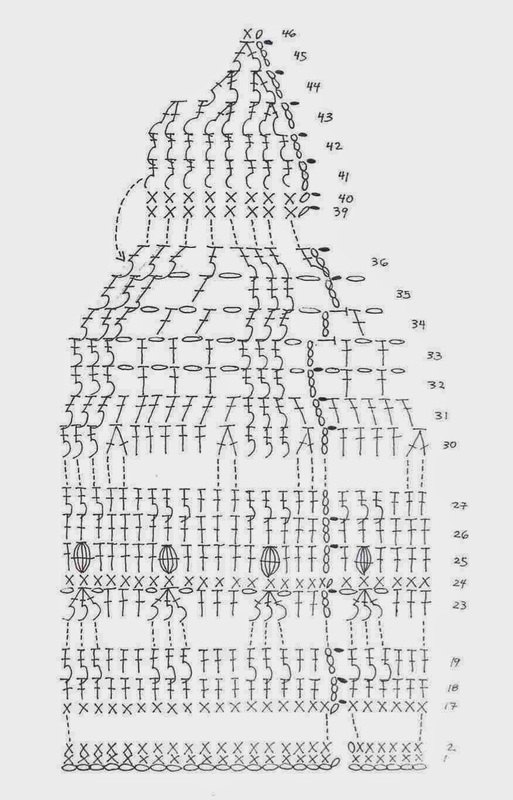 The stitch pattern is in multiples of 12. 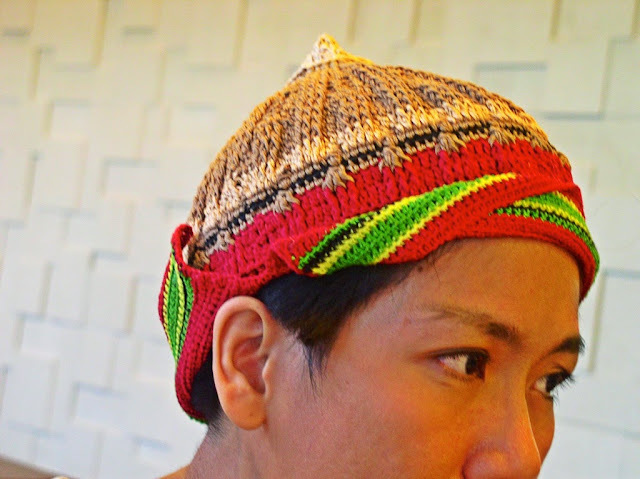 The colorful version of the hat is made with two strands of cotton thread (size 8). 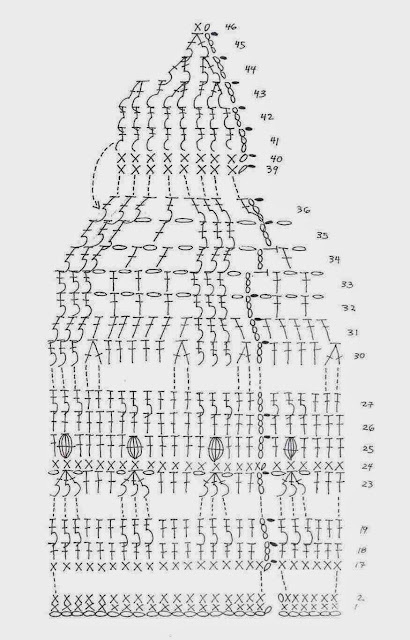 The hat is worked from the brim to the crown, first in rows, then in rounds. If you have difficulty working the Back Post Double Crochet Stitches in rnds 41-42, an alternative technique is to turn the hat inside out and work Front Post Double Crochet Stitches. Front Post Double Crochet Three Together (FPdc3tog): Yo and insert hook from the front to the back around the post of the dc on the previous row, pull up a lp, yo, draw through first 2 lps on hook; [yo, insert hook from front to back to front around next post of next st and pull up a lp, draw through first 2 lps on hook] twice, yo, draw through all loops on hook. Front Post Double Crochet Two Together (FPdc2tog): Yo and insert hook from the front to the back around the post of the dc on the previous row, pull up a lp, yo, draw through first 2 lps on hook; yo, insert hook from front to back to front around next post of next st and pull up a lp, draw through first 2 lps on hook; yo, draw through all loops on hook. Back Post Double Crochet (BPdc): Yo and insert hook from the back to the front around the post of the dc on the previous row. Complete as for regular dc. Double crochet two together (Dc2tog): [Yarn over, insert hook in next stitch, yarn over and pull up loop, yarn over, draw through 2 loops] 2 times, yarn over, draw through all loops on hook—1 stitch decreased. Double crochet three together (Dc3tog): [Yarn over, insert hook in next stitch, yarn over and pull up loop, yarn over, draw through 2 loops] 3 times (4 loops on hook), yarn over, draw through all loops on hook—2 stitches decreased. Single crochet two together (Sc2tog): Insert hook into stitch and draw up a loop. Insert hook into next stitch and draw up a loop. Yarn over, draw through all 3 loops on hook. Row 2-3: Ch 1, sc in each sc, turn. Row 4: With yellow, ch 1, sc in each sc, turn. Row 5-7: With green, ch 1, sc in each sc, turn. Row 8: With yellow, ch 1, sc in each sc, turn. Row 9: With black, ch 1, sc in each sc, turn. Row 10: With green, ch 1, sc in each sc, turn. Rows 11 – 16: With red, ch 1, sc in each sc, turn. Rnd 18: Ch 3 (count as dc here as throughout unless otherwise stated), dc in each sc across. Sl st in first dc to join. (96 dc made). Rnds 19-22: Ch 3, sk first dc, dc in next 2 dc, *FPdc around each of next 3 dc, dc in next 3 dc; rep fr * all around. Sl st in first dc to join. Rnd 23: With medium brown, ch 3, sk first dc, dc in each of next 2 dc, *ch 1, FPdc3tog over next 3 FPdc, ch 1, dc in each of next 3 dc; rep fr * all around. End with ch 1, FPdc3tog over next 3 FPdc, ch 1 and sl st in first dc to join. Rnd 24: With black, ch 1, sc in first dc and in each of next 2 dc, *sc in ch sp, sc in top of Fpdc3tog, sc in ch sp, sc in each of next 3 dc; rep fr * all around. End with sc in ch sp, sc in top of Fpdc3tog, sc in ch sp, sl st in first sc to join. Rnd 25: With medium brown, ch 3, sk first sc, dc in each of next 3 sc, *popcorn in next sc, dc in each of next 5 sc; rep fr * all around. End with popcorn in next sc, dc in last sc, sl st in first dc to join. Rnd 26: With beige, ch 3, sk first dc, dc in each st all around. Sl st in first dc to join. (96 dc made). Rnd 27: Ch 3, sk first dc, dc in next 2 dc, *FPdc around each of next 3 dc, dc in next 3 dc; rep fr * all around. Sl st in first dc to join. Rnds 28-29: With medium brown, ch 3, sk first dc, dc in next 2 dc, *FPdc around each of next 3 dc, dc in next 3 dc; rep fr * all around. Sl st in first dc to join. Rnd 30: Ch 3, sk first dc, 2 dc tog over next 2 dc, *FPdc around each of next 3 FPdc, 2 dc tog over next 2 dc, dc in each of next 5 sts, 2 dc tog over next 2 dc; rep fr * all around. End with FPdc around each of next 3 FPdc, 2 dc tog over next 2 dc, dc in each of last 4 sts. Sl st in first dc to join. Rnd 31: Ch 3, sk first dc, *dc in next 2dctog, FPdc around each of next 3 FPdc, dc in next 2dctog, dc in each of next 5 dc; rep fr * all around. End with dc in each of last 4 dc. Sl st in first dc to join. Rnd 32: Ch 4 (count as dc, ch 1), sk first 2 dc, *FPdc around each of next 3 FPdc, [ch 1, sk next dc, dc in next dc] 3 times; ch 1, sk next dc; rep fr * all around. End with FPdc around each of next 3 FPdc, [ch 1, sk next dc, dc in next dc] 2 times; ch 1, sl st in first dc to join. Rnd 33: Ch 4 (count as dc, ch 1), sk 2 dc and ch sp, *FPdc around each of next 3 FPdc, [ch 1, sk next ch sp, dc in next dc] 3 times; ch 1, sk next ch sp; rep fr * all around. End with FPdc around each of next 3 FPdc, [ch 1, sk next ch sp, dc in next dc] 2 times; make hdc in first dc to join. Rnd 34: Ch 4 (count as dc, ch 1), sk first dc and ch sp, *FPdc around each of next 3 FPdc, ch 1, sk next ch sp, dc in next ch sp, ch 1, dc in next ch sp, ch 1, sk next ch sp; rep fr * all around. End with FPdc around each of next 3 FPdc, ch 1, sk next ch sp, dc in next ch sp, hdc in first dc to join. Rnd 35: Ch 4 (count as dc, ch 1), sk first dc and ch sp, *FPdc around each of next 3 FPdc, ch 1, sk next ch sp, dc in next ch sp, ch 1, sk next ch sp; rep fr * all around. End with FPdc around each of next 3 FPdc, ch 1, sk next ch, sl st in first dc to join. Rnd 36: Ch 3 (do not count as a stitch here and throughout), FPdc around first dc, sk ch sp, *FPdc around each of next 3 FPdc, sk ch sp, FPdc around dc, sk ch sp; rep fr * all around. End with sl st in first FPdc to join. Rnd 37: Ch 3, FPdc around each FPdc all around. Sl st in first FPdc to join. Rnd 38: Rep rnd 37. Rnd 39: With beige, ch 1, sc in each FPdc all around. Sl st in first sc to join. Rnd 40: With medium brown, ch 1, sc in each sc all around. Sl st in first sc to join. Rnd 41: With beige, ch 3, BPdc around each FPdc in rnd 36 (you will be working the stitches behind rnds 39-40). Sl st in first BPdc to join. Rnd 42: Ch 3, BPdc around each BPdc. Sl st in first BPdc to join. Rnd 43: Ch 3, *FPdc2tog over the next 2 FPdc, FPdc around next FPdc; rep fr * around. Sl st in first FPdc to join. Rnd 44: Ch 3, *FPdc2tog over the next 2 FPdc; rep fr * around. Sl st in first FPdc to join. Rnd 45: Rep rnd 44. Rnd 46: Sc2tog around to close the top of the hat. Fasten off. With red yarn, join with sl st to sc at first row. Work sc all around the brim of the hat. Fasten off. Weave in all ends and block.